I could get addicted to making my own clothes. 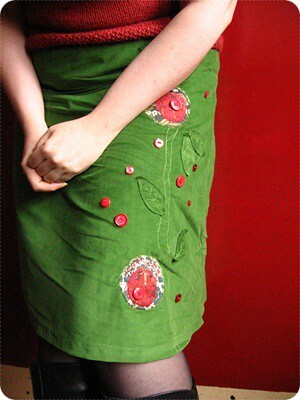 This green corduroy skirt is ridiculously Just What I Like & Cannot Find in Stores, that I cannot believe I did not do this dress-making lark years ago. One happy seamstress & wearer. I altered the pattern (of course I did). The appliqué was done different to the pattern suggestion, I added lining and did away with the slightly clumsy bias binding around the waist. Klimt? Why not. In fact, look at Gustav Klimt's "The Kiss" and tell me that you cannot see it. Just me? Okay then..
And I'm wearing my own handmade St. James sweater with this skirt. Oh, wardrobe love. In other crafty news, I spent the morning trying to decipher a crochet pattern written in Afrikaans using a Dutch crochet glossary, Google Translate and reverse engineering from photo. Adventurous! After an hour and six rounds, friends kindly pointed me to an online English translation of the pattern.. and I felt a bit silly. Finally, a big HAPPY BIRTHDAY to one of the loveliest people I have ever met, Paula. This little video is for you..